If you think your holidays are busy with family and kids and whatnot, think again. 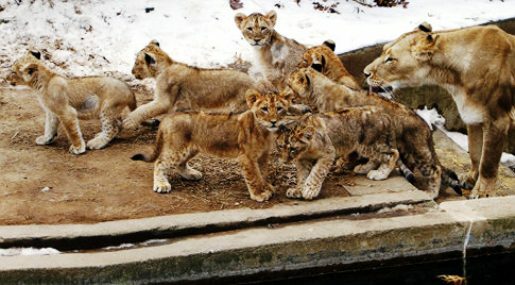 Shera the lioness is having an extra-busy holiday season as she’s got not one, not two, but seven new cubs to care for. That’s the hubbub at the Smithsonian National Zoo in Washington, D.C., where seven lion cubs are making waves and wowing visitors with their adorable kittenish antics. Their father, Luke, is responsible for all seven of the babies via two lionesses. One litter was born August 31 and the other was born September 22. Let’s all say it together: Awww, kitties! The seven baby lions are named John, Fahari, Zuri, Lelie, Baruti, Aslan, and Lusaka. Aslan is named after the lion from The Chronicles of Narnia. Lusaka is named after Lusaka, a lioness at the zoo who passed away at age 18 this year at the zoo. John was named after a former zoo director. Fahari and Zuri are named after the Swahili words for “magnificent” and “beautiful,” respectively. Lelie and Baruti were named by two local elementary schools.